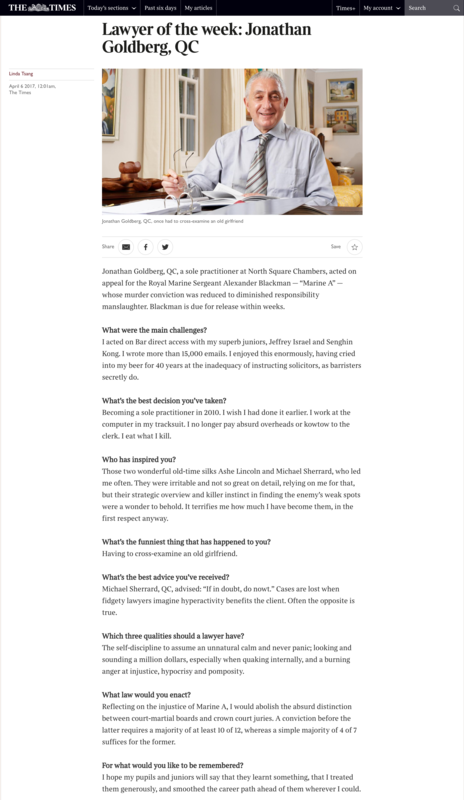 Jonathan Goldberg QC - Jonathan Goldberg Q.C. Jonathan Goldberg Q.C. is known as one of the United Kingdom`s leading trial advocates and defenders. His rate of acquittals in high-profile jury trials is second to none. He has defended in over a hundred murder trials, and has expertise in civil cases where there is an interface of civil and criminal disciplines. This includes such fields as: defamation, contentious commercial disputes, inquests, professional disciplinary tribunals, commercial fraud, bankruptcy, employment disputes, disputed wills, and contempt of court. He is famous for his rare combination of fierceness and fearlessness in the courtroom and in negotiation proceedings. He is known for his style and perfectionism. In order to serve his clients with the individual attention and discretion they deserve, he now practises from his own boutique chambers with his own dedicated clerk and support staff. Mr. Goldberg has appeared as Defence Counsel in many of the most famous criminal trials of the past 4 decades. He makes regular appearances at the Old Bailey, and has appeared in courts throughout the United Kingdom as well as Malaysia, Ireland, Bermuda, the Caymans, and Gibraltar. He has argued frequently in the House of Lords, Court of Appeal, and Privy Council. He has defended in numerous Courts Martial of the British Armed Forces (and not lost one). He is called upon to advise and consult on challenging cases in Singapore, Hong Kong, Botswana, the Bahamas and the United States, where he is also qualified at the New York State Bar. Because of his unsurpassed rate of success and his piercing advocacy skills Mr. Jonathan Goldberg Q.C. is often called upon to defend solicitors, accountants, police officers and other public figures. A list of his noteworthy cases appears on this website. A newspaper profile of him appears here. Mr Goldberg makes frequent television appearances on CNN, Al Jazeera, Sky and ITV commenting on issues of legal interest. 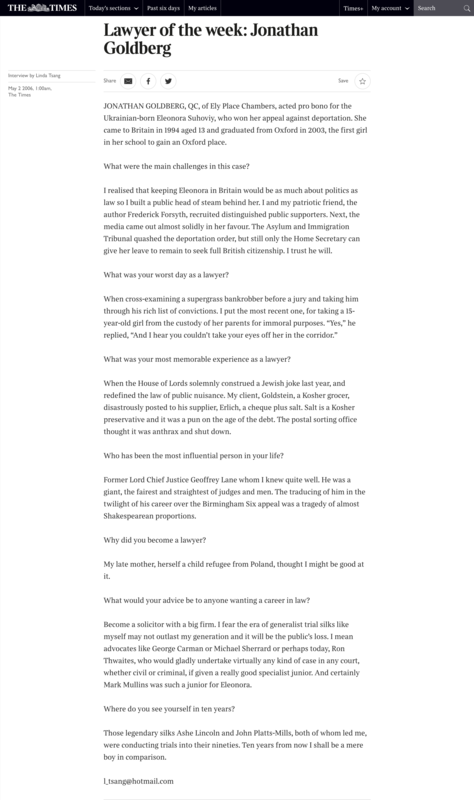 For several years he wrote a column in the Jewish Chronicle entitled Ask the QC - see here. He was named as The Times Lawyer of the Week in 2006 for his successful pro bono defence in both the legal and political arenas, of the brilliant Oxford graduate Eleonora Suhoviy, a Ukrainian national who had lived here since childhood, and whom the Home Office now wished to deport, instead of allowing her dream to become a British citizen - Read More. In March 2017 he won the historic appeal against his murder conviction of Marine Sgt Alexander Blackman known as Marine A. He was again named Times Lawyer of the Week - Read More. It is very rare to be awarded this accolade twice. See also the separate Marine A webpage. "We are grateful for the very clear and succinct way in which this appeal has been conducted by Mr Goldberg. It is the view of all the members of this Court that the way in which he conducted the case was admirable". Sept 1985: Admitted to the New York State Bar, U.S.A.